"WOW!" Everytime I look at this picture, I always think, "WOW!" Not trying to brag or anything like that, but just look at it! It's finally finished. 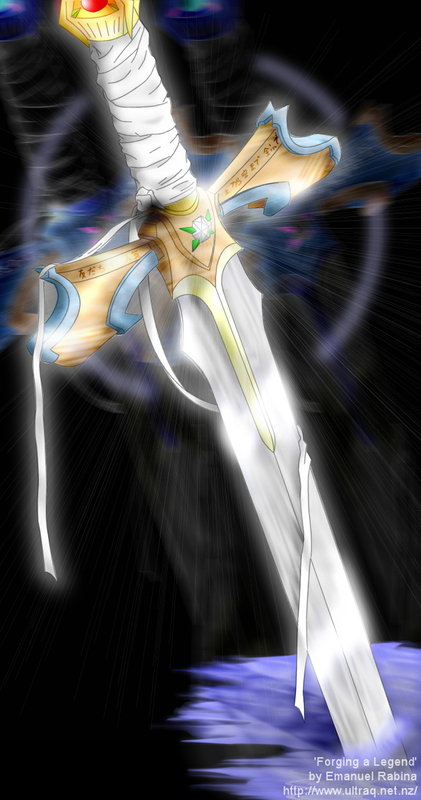 The picture in my mind of the fabled sword from Final Fantasy VI, the Atma Weapon. As stated in another of my drawings of the Atma Weapon, it has some elements from other role-playing-games, Zelda 2: The Adventure of Link, Lunar: Silver Star Story and Lunar 2: Eternal Blue. Each of which are old, and good games (though I've never played the Lunar series, I've heard they're epics). My favourite part about this drawing has to be the shining/reflective blade. I've never been able to make anything look or appear shiny before. Previous attempts have made the object look either too grey, or like concrete. Those of you familiar with Final Fantasy VI will know that the Atma Weapons' blade and strength increases with each characters' levels. So, I've made allowances for this by having the sword in water. You can see it's reflection, and the rest of the blade fade into the depths of the water. As for how far the blade goes, or how deep the water is, that's all up to you.